'Dedication to Leonardo da Vinci' by Konstantin Dverin. Konstantin Dverin, an artist from the Siberian city of Novokuznetsk (about 2,300 miles east of Moscow), has completed a painting that attempts to finish Leonardo da Vinci’s “Adoration of the Magi.” Da Vinci began the work in 1481, but never finished it. It has hung in the Uffizi Gallery in Florence, Italy since 1670. 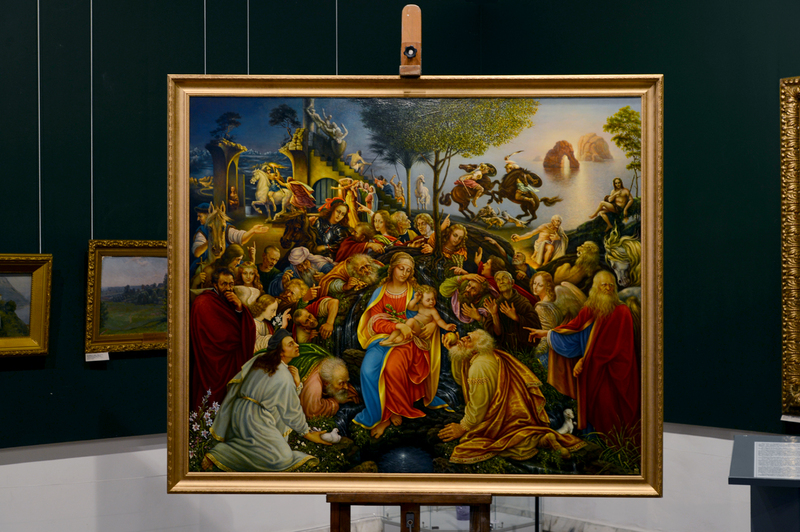 Dverin’s work, entitled “Dedication to Leonardo da Vinci,” will be displayed in the Novokuznetsk Art Museum until Nov. 24. In describing the thought process that led him to attempt the work, Dverin said: “Nobody tried for 540 years to say anything on this subject. And then I thought: What prevents me from doing this? Basically, nothing, except, of course, the greatness of this name. I got some audacity and courage, and tried to do this. I worked for four months, the result is in front of you." Dverin spent a great deal of time studying the life and work of da Vinci, carefully analyzing the Italian’s artistic techniques, before beginning to paint. His painting is not so much an attempt to complete the work as da Vinci would have, but a version that honors the Italian artist and his style. At a press conference before the opening of the exhibition, Dverin told reporters: "I thought: has anybody tried not so much to complete, but to develop and continue the idea?" His developments include the reflection of the star of Bethlehem in a well before Mary as well as the figures of Raphael, Michelangelo, Botticelli and considerably aged da Vinci in the foreground. Following the tradition of the Renaissance artists to portray themselves and the people of their circle, the Novokuznetsk artist also placed pictures of friends and acquaintances among the characters.